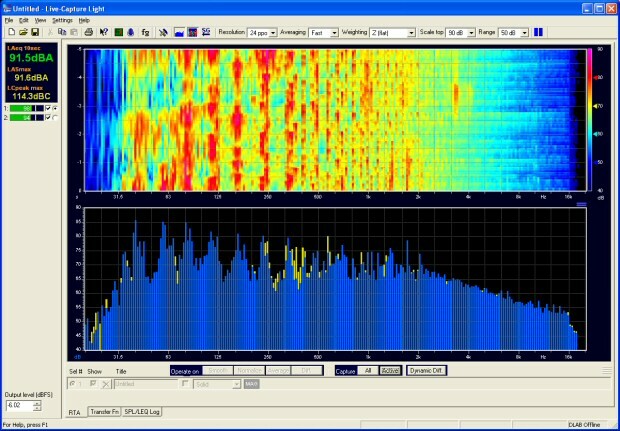 A completely free spectrum analyzer (RTA), with a 30-day demo for transfer function and SPL log, will be available for download at release date. For pricing and order, please go to the Order area. 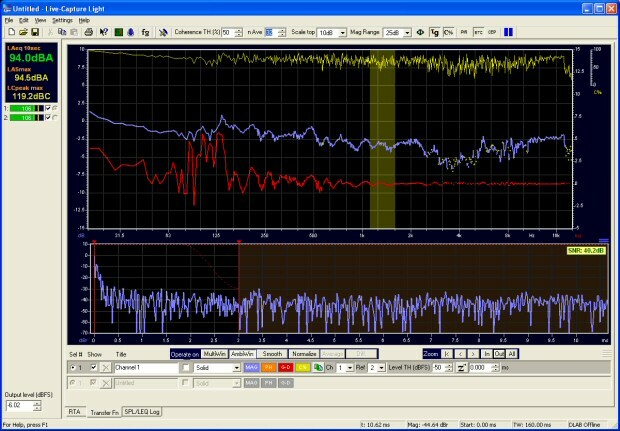 Live-Capture is a simple to use PC-based software tool for real-time live-sound measurements. Live-Capture measures time-domain and frequency domain simultaneously, using the program material (music and speech) with the audience present. Live-Capture is ideal for sound reinforcement system optimisation. A range of newly developed analyzing tools provides fast and accurate tuning information; delay-finder with group-delay and Cepstrum analysis, Auto EQ finder, sound level logging and reverberation time graph. Live-Capture uses threaded computing to acquire impulse responses between 0.35 to 11 seconds and suitable large FFTs to display time domain and frequency domain data in up to 23.4 frames per second refresh rate. Advanced complex averaging are used in both domains, taking the coherence and phase stability in account. The default resolution is 96 points per octave, 192 ppo is max. Sophisticated windowing functions allow the user to window out room reflections and focus on either equalizing the direct sound while retaining low frequency resolution or spatial averaging of the room transfer function. For room tuning and sound reinforcement system optimization, Live-Capture supports spatial averaging. This allows the user to perform multiple measurements throughout the coverage pattern of the sound reinforcement system and base system eq on the weighted, spatially-averaged response. 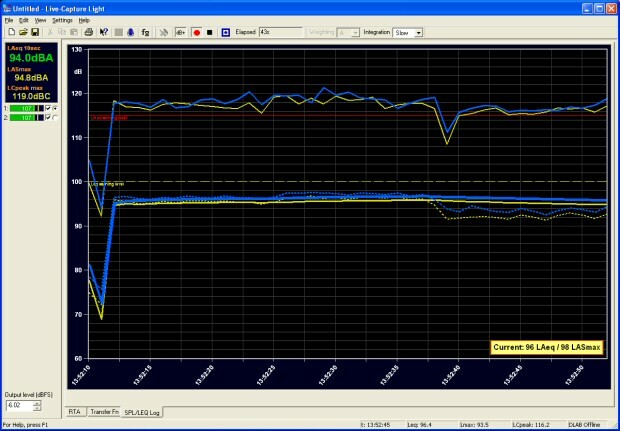 The Auto Peak finder can automatically find peaks and dips in the magnitude response, in a predefined frequency range. These peaks or dips can be identified as parametric filter with the Auto EQ tool. The Auto-Delay updater will facilitate the selection of microphone position and compensate for time invariance’s. · Soundcard: Windows compatible (Wave/WDM or ASIO) with stereo inputs and outputs, 16-bit/44.1k to 24bit/96k sampling, with full duplex (simultaneous play and record) capability. Lake is registred trademarks of Lab.gruppen. FIR-Capture, Quality-Capture, RT-Capture, Room-Capture, Live-Capture, WaveCapture and their logos are trademarks of GSW and 7dbm Electronics AB, Sweden. Copyright 2006-2013 GSW and 7dbm Electronics AB. All rights reserved. This product is protected by Swedish and International copyright and other intellectual property laws and international treaties. Unauthorized use, distribution or duplication of this product is strictly prohibited.